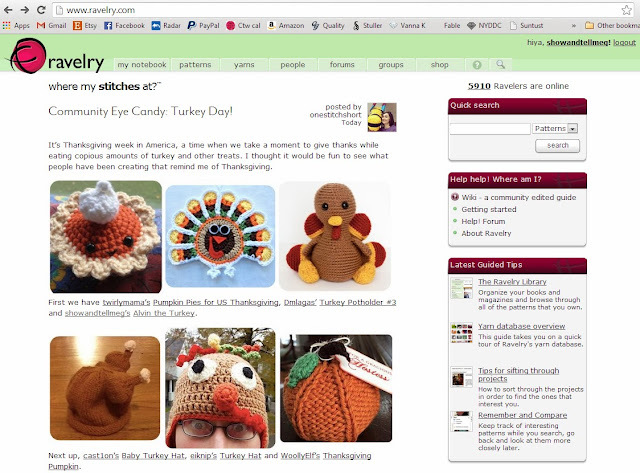 My Alvin the Turkey was featured on the front page of Ravelry! It's part of the Thanksgiving edition of Community Eye Candy, and I was so excited I wanted to jump up and down! I've been getting lots of comments on it and that just makes you feel wonderful. I feel like an internet celebrity, lol. Pretty exciting. And that's not all - the internet has been very good to me lately :) A few weeks ago, I entered a giveaway on the Stitch Diva Studios Facebook page and I won! I won the new Knitting Outside The Swatch book by Kristin Omdahl. It's full of really neat knitting motifs and includes a few patterns you can use to put the motifs together. I'm excited to give some of them a try! Then, a week later Stitch Diva Studios was having their Week of Giveaways. Of course, I entered them all. Each day. And I won again! I won a gift pack that included the Tunisian Crochet Craftsy Class, Stitch Diva's Tunisian Crochet: Simple Twists on an Old Technique pattern collection (15 patterns in all! ), and a Jenkins Handcrafted Maple Crochet Hook with Extension in Size S (19mm). The gift pack was designed to be what you need to make the Stashbuster Blanket pattern (the one on the cover of the book), so I get to learn Tunisian crochet and use the hook to make it :) I've already watched several lessons in the class and I just love Jennifer Hansen's teaching style. If you haven't checked out Stitch Diva before, I highly recommend it. Her designs are very edgy and new, plus she loves to make new patterns for old techniques. I also have her Beyond Basic Broomstick Lace Class on Craftsy and I LOVE that class. It's so cool to keep these old techniques alive. 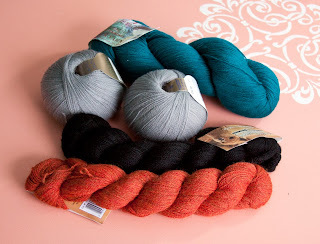 I also got my Craftsy yarn purchases a few days ago :) They are so soft! This is my first time buying lace yarn as well as my first time buying alpaca - I can totally see why people like it so much . It's silky and soft and I can't wait to make a shawl with them!